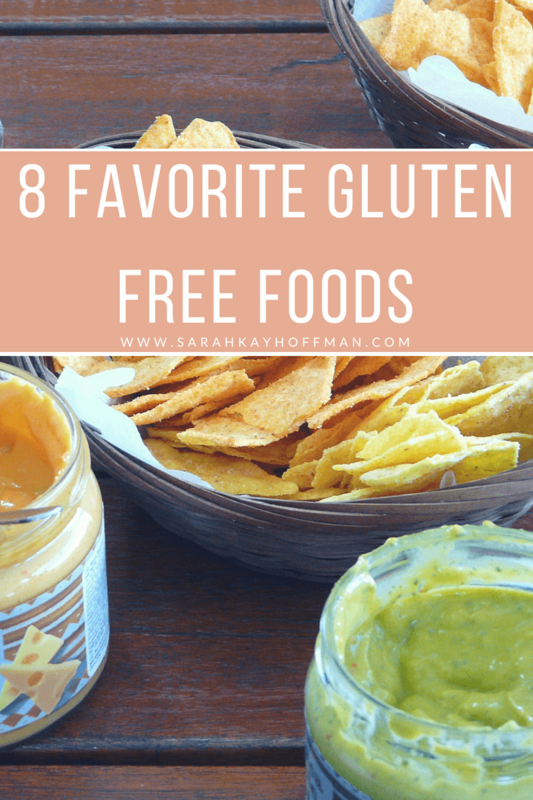 Today I am 8 years gluten free so I wanted to share 8 favorite gluten free foods. Gluten free is really only over-the-top expensive if you buy products labeled “gluten free.” If you stick to the basics, it’s no more expensive than any other way of living. In fact, you can do gluten free on a budget. I still maintain this, but I also know that making your own things 24/7 is not realistic. It’s the reason I came out with my Travel Guide a couple years back. Because people are always wondering about quick and simple snacks and things they can buy from the store, I decided to keep that the focus for this year’s anniversary celebration post. In no particular order and with no one sponsoring this post, here are my (at least current) 8 favorite gluten free foods. Click HERE to save these 8 favorite gluten free foods for later. 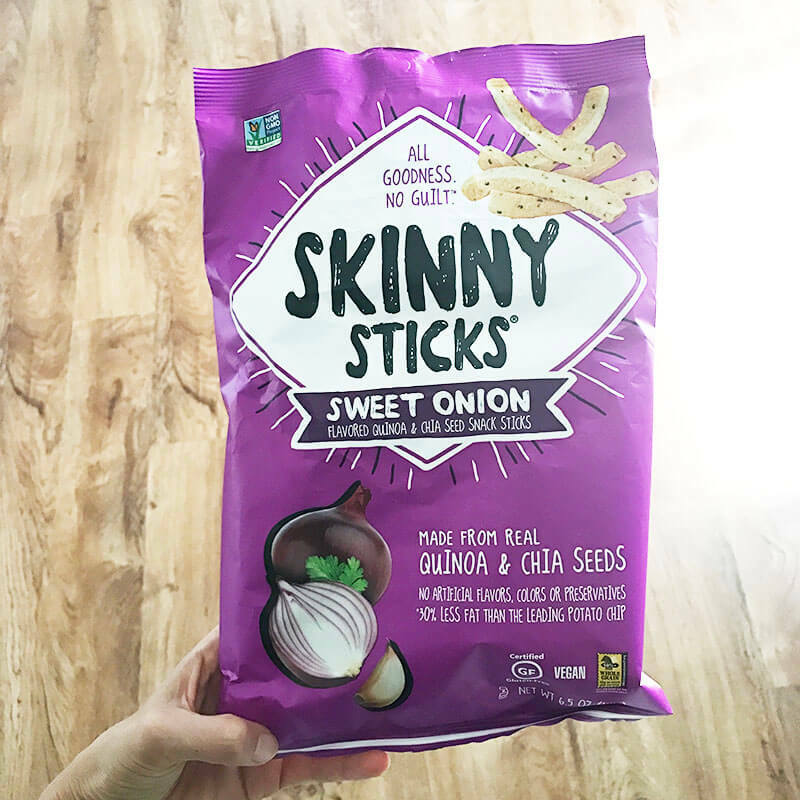 Skinny Sticks, Sweet Onion flavor. They recently changed their packaging, but it’s still the same delicious product. Our favorite is the ‘Sweet Onion’ flavor. They taste like Funyuns, only their ingredient list is in line with those who can’t do gluten. Once I start eating them, I can never stop; Ryan and the kids are the same. While I don’t think they have the best ingredient list ever, they are Certified Gluten Free. Buy your own bag: Amazon or at your local store (around here they are at Hy Vee, but obviously not the one in Waseca because this one doesn’t get much of anything). Made in Nature Italian Espresso Coconut Chips. Coffee and coconut; two of my favorite things, placed perfectly together. Are you supposed to give children these? I don’t even know, but I do. And they love them. (Maybe that’s why the kids are so insane.) I’m constantly eating handfuls of this stuff, and I love eating it after it’s been in the freezer awhile. Something about that extra crunch. The ingredient list rocks, too: Organic Dried Coconut Strips, Organic Maple Syrup, Organic Vanilla Extract, Organic Espresso, Sea Salt. Buy your own bag: Amazon, the Made in Nature website (you get free shipping if you spend $25 and every single thing from Made in Nature is delicious), or at your local store (they are everywhere now). Paleo Bar. I’ve been a fan since the first bite of the Sunflower Butter bar, and I featured them as part of my Top 5 Paleo Bars post. I continue to buy these bars by the box on Amazon, but lately I’ve been trying other ones, too. They carry some of them at Hy Vee in Owatonna and Mankato, so I’ll grab different flavors here and there. I really love the Mint Chocolate one, but I don’t grab it too often because of the Stevia they put in it. Regardless, they are all gluten free (and free from many other things as well). Buy your own bar: Amazon (linked above), the Julian Bakery website, or at your local store. Simple Mills Almond Flour Crackers. I just love these crackers, even the plain ones. The kids like having them for bedtime snack at night, too, sometimes with peanut butter. I love just eating them as-is. They have just the perfect amount of salt. Buy your own box: Amazon, Costco, Thrive Market, or at your local store. Nikki’s Coconut Butter Dark Chocolate Fudge. I could live on chocolate. I love it so much, and every single time I’m craving it, this flavor hits the spot. The only ingredients it contains are: Organic Unsweetened Coconut, Organic Cocoa Liquor, Organic Coconut Sugar, Organic Vanilla Extract, Himalayan Sea Salt. 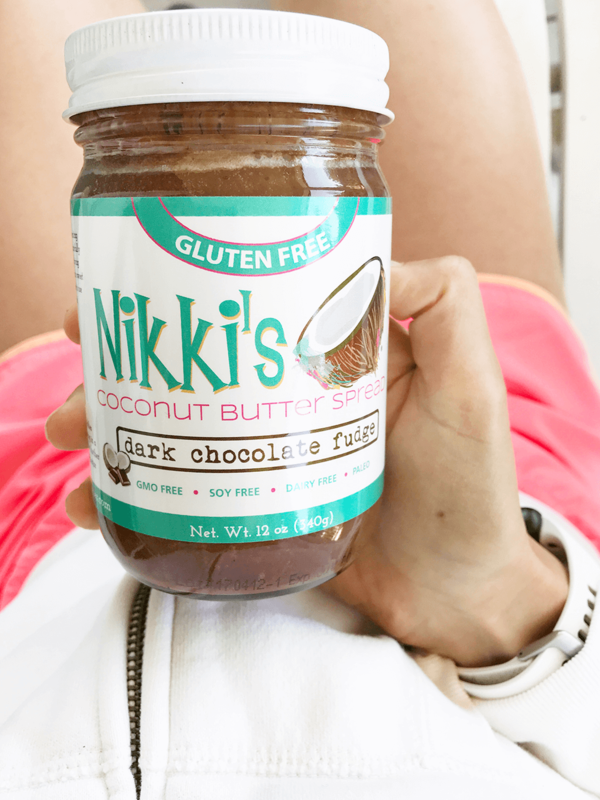 Buy your own jar: Amazon, or via Nikki’s website (shipping is only $4.99 or free if you buy 3 jars – and all flavors are incredible). EPIC Provisions Pink Himalayan Sea Salt Pork Rinds. Beware: it’s easy to eat an entire bag in one sitting. These are ultra-addictive. I recently bought the 4-pack on Amazon, and they were gone in a week. Our whole family loves them, and I love giving them to the kids. There are barely any ingredients in them: Baked Pork Skins, Pork Fat, Pink Himalayan Sea Salt, Sea Salt. So dang good. Buy your own bag: Amazon, Thrive Market, or at your local store. NOW Foods Crunchy Clusters Almond. I had these while I was visiting NOW Foods in Chicago, and fell in love with them. They are bite sized snacks, and perfect for on-the-go munching. If you like the salty/sweet combination, they are a mild version of that. Buy your own bag: Amazon, or at your local store. Little Northern Bakehouse Seeds and Grains Bread. You didn’t think I would forget a gluten-free bread recommendation, did you? No, I don’t eat a ton of bread, but I always have a loaf or two on hand in the freezer for when someone isn’t feeling well. Last week, at the end of the Neomycin, I had a lot of nausea, so I found myself eating a few slices. And I just love this brand. They say it has a crunchy texture, but I don’t agree with that at all. I think it’s fairly chewy, and I love how carb-y it tastes. If the only thing you had to remain was gluten free, I believe the world is totally on your side, and you can find anything and everything you want at any moment to fill any craving. Eight years ago today I believed that if I just went gluten free, all the problems would disappear, but also, eight years ago today I never knew I was living with SIBO (my guess is that I had already been living with it for several years by then). Today I know that, while the gluten-free lifestyle is part of how I live each and every single day, it’s just not enough – for me. I realized something for my own health and healing journey this past week that has felt both sad and hopeful. It’s a truth I have fought for years now, but a truth that, if I don’t just give into, might make me feel miserable for so much longer. I’m hoping to share it with you tomorrow. I hinted at it in my Instagram stories yesterday. Thankful for 8-years gluten free, and what remaining gluten-free has meant for my health and my life. Question: Now that you know my current 8 favorite gluten free foods, what are yours? p.s. There is an entire category filled with all things gluten free on my website. You’ll find many more products and recipes there. 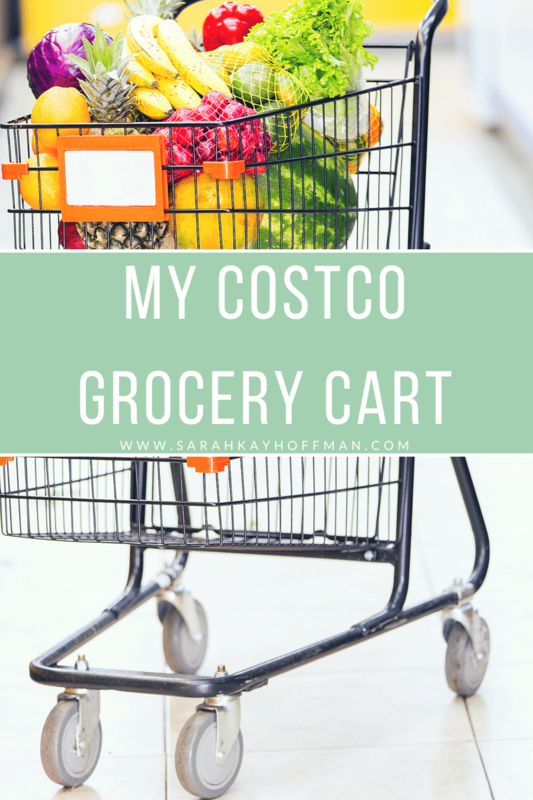 Click HERE to save ‘My Costco Grocery Cart’ for later. Let’s first get this out of the way. The Costco I shopped at last weekend was the one in Burnsville, Minnesota. If you’ve ever gone to more than one Costco, then you know that they do not all carry the same thing. When we lived in California, I found so many things at the Costco in Livermore that I could never find at the one in Tracy. Hence why I did The Real Food Shopping Guide for Costco at Livermore instead of Tracy. But for my friends who live in Minnesota, don’t think we are being shorted here on the quality items. I think the Burnsville Costco is better than the one in Livermore and definitely better than the one in Tracy. With that said, here is what was in my Costco grocery cart. As a little extra, I’ve made some notes next to each. All items are gluten free because, naturally, about 90%+ of the things in our house are gluten free. Teton Waters Ranch Sausage. I was introduced to Teton Waters Ranch at Expo West this past March and fell in love. They are incredible. We all love them; Ryan, the kids, and I.
Organic Ground Turkey, triple pack. Turkey is good for almost any diet, and because this is ground, it’s versatile. Organic Ground Beef, triple pack. Similar to the turkey, I love having a triple pack on hand so I can make it up whenever. We form these into patties a lot for burger night. 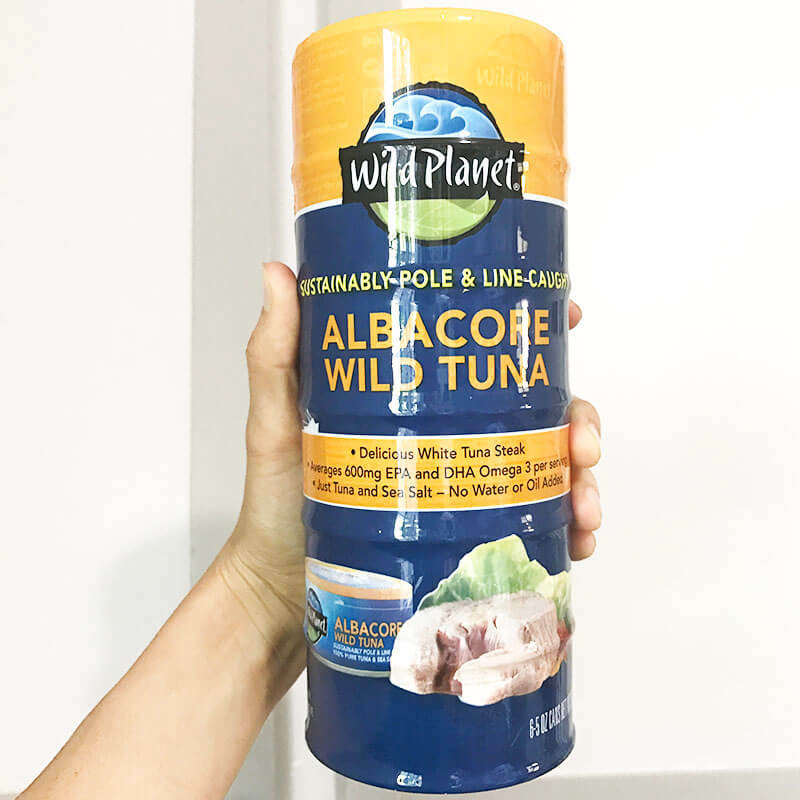 Wild Planet Albacore Tuna. Wild Planet is my favorite, but if you buy the cans individually at most stores, it’s expensive (like $3+ per can). It’s still not an inexpensive item, but it’s a high-quality tuna that you can eat on-the-go or make into a Cheesy Tuna Casserole (my version is gluten, grain, and dairy free). Organic Apples. I’m eating these right now because they are high-FODMAP (while I’m taking Rifaximin and Neomycin). Organic Greek Yogurt. This is 100% for Samarah. She has yogurt and honey almost every single morning for breakfast. Isaiah and Amiya can’t do dairy, so I try to have her sneak it around them as much as possible to avoid meltdowns. 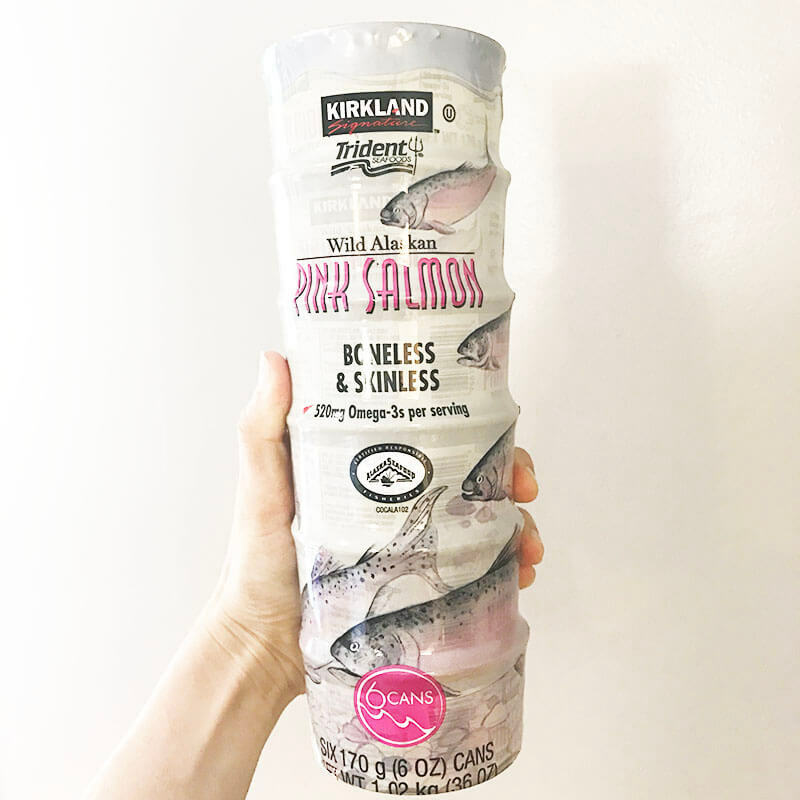 Wild Alaskan Pink Salmon. I do similar things with this as I do the tuna. It’s an easy way to boost the Omega-3’s and a great Vegetarian option. Organic Whole Milk. This is also 100% for Samarah, but sometimes Ryan has a glass, too. Simple Mills Sea Salt Crackers. I started buying these for Isaiah and Amiya, but now I can’t stop eating them. 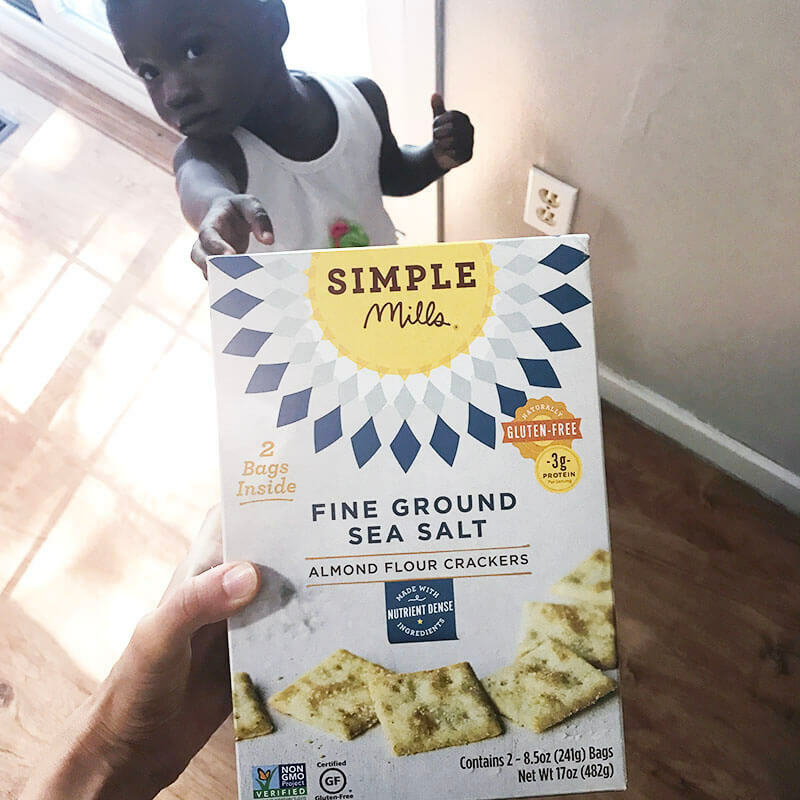 Simple Mills is just so good (their whole line of products), so when I saw their jumbo boxes of crackers at Costco, I was super excited (Amiya was, too!). I think the box contains 2-3 bags and it’s $8.99. Organic Amylou Breakfast Sausages. I first found these in California, but then one day, the Tracy location stopped carrying them. We missed them, so when they popped up at Costco in Minnesota, we stocked up immediately. If you go to the Burnsville Costco you will find them to your right just before you enter the walk-in dairy fridge. Organic French Green Beans. I have found that with almost any of our digestive issues, green beans are one of the few vegetables we can all do. So we eat a lot of them. My kids love them, too, but the secret is that you have to drench them in oil. Lately they have been digging the Nutiva Coconut Oil with Butter and Garlic Flavors. 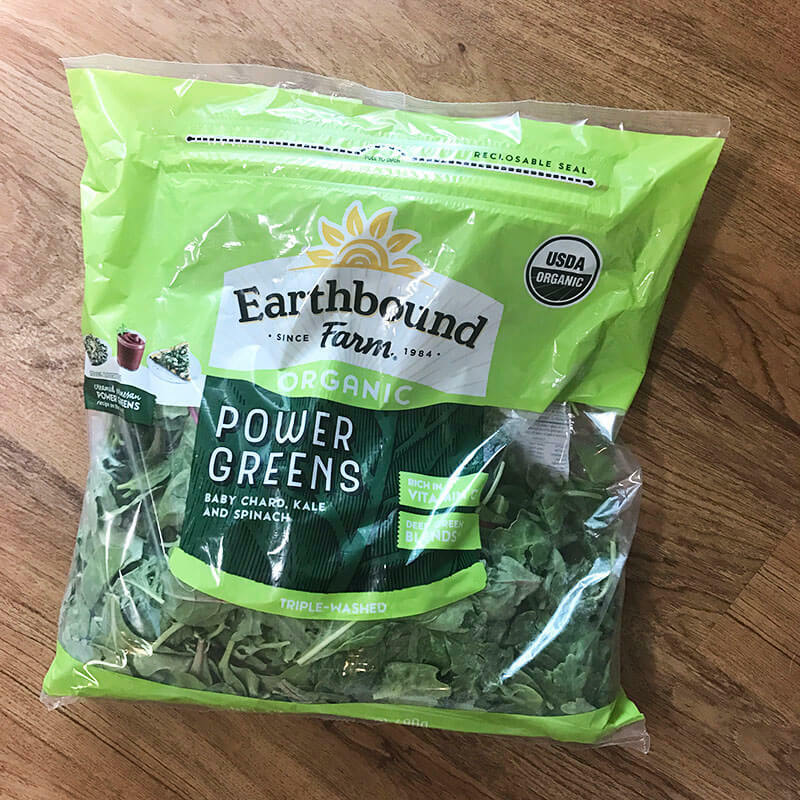 Earthbound Farm Power Greens. Sometimes I make large salads with this, but usually the reason I buy it is for making the kid’s smoothies. I have been making a lot of low-FODMAP smoothies for everyone, and this greens blend is great for it. Organic Baby Carrots, the jumbo bag. Snacks. Amiya and Isaiah mostly love these for snacks. Sam will eat them with lots of some sort of dip. I also use these to roast with my whole chickens because I love when they are doused with oil and softened. Organic Valley Stringles String Cheese. Again, 100% for Samarah. She’s the only one who does a ton of dairy in this house. 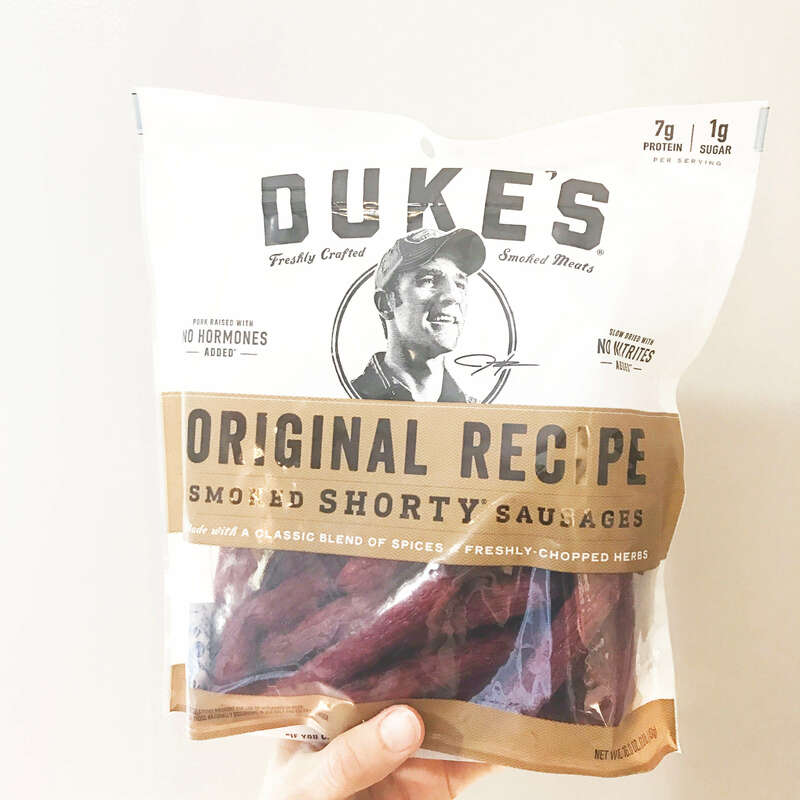 Duke’s Smoked Shorty Sausages. I had never seen these before, but they are mini sausage sticks in a large bag. It was my impulse buy for the day and I picked them up for Ryan to keep with him at work. 5 lb bag baby potatoes. I can’t tell you how many times a week we have roasted potatoes. We basically toggle between rice, root veggies, and potatoes every single night. For these, all I do is slice thin, toss with a ton of Olive Oil and bake for about 45 minutes – an hour at 400 degrees. The kids absolutely love them! I love dipping them in Sir Kensington’s mustard. Avocados, bag. Samarah, Ryan, and I eat a lot of avocado. It’s high-FODMAP so I’m on a major avo kick currently. 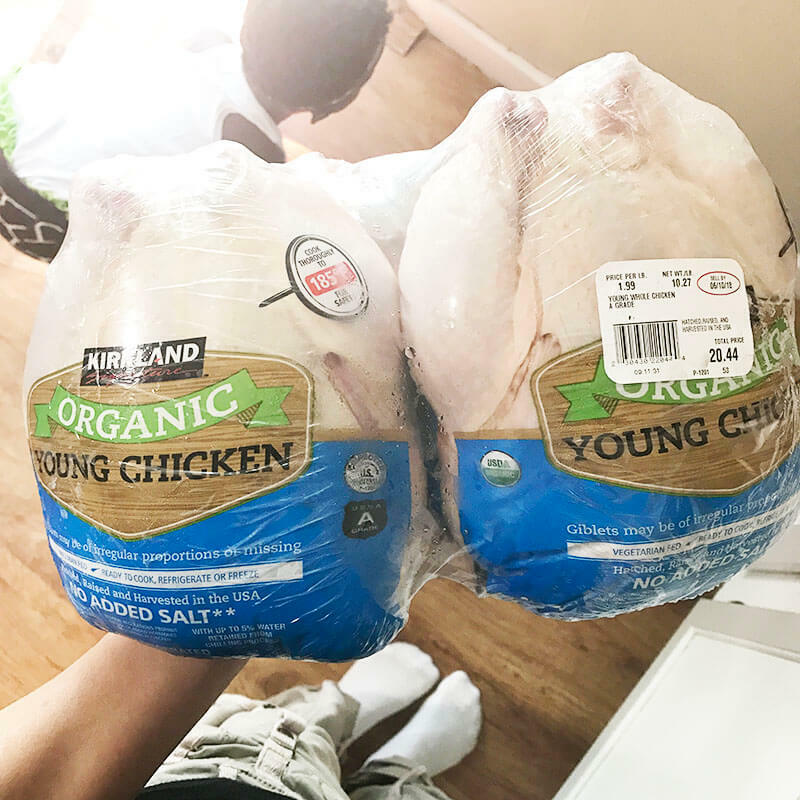 Organic Whole Chicken, double pack. And of course the whole chicken. It’s hard for me to justify chicken breasts when it’s so much cheaper to buy the whole chicken. I love baking a whole chicken for dinner because after we’ve eaten all the meat, I can then save the bones in the freezer for bone broth time. This double pack was about $20 and that goes a long ways. Let it be known that I would have bought at least 3 bags of bananas but Costco was completely sold out of them. Like, whaaaat?! I meant to save my receipt, but when I went to look for it, it was nowhere to be found, so I’m guessing I threw it out on accident. Because I threw it out, I think that was my Costco grocery cart in its entirety, but what I do know for sure is that the total was $190.00. Though it might seem like a lot, the bulk of what I bought that day was meat so naturally it would be higher. Also, this will last us 2-3 weeks (for some of the items) and if you’ve never been around my kids at mealtime, you must know that they (literally) usually out eat Ryan and I (especially Isaiah). I hope you’ve enjoyed my Costco grocery cart. I like the grocery shopping cart posts because I’m trying to give practical ways to buy and eat for your family, so if you’d like me to do more, just let me know! I’m happy to do other grocery stores, more finds at Costco, online shopping, any of it. I am doing some sort of food shopping probably 3 days a week. 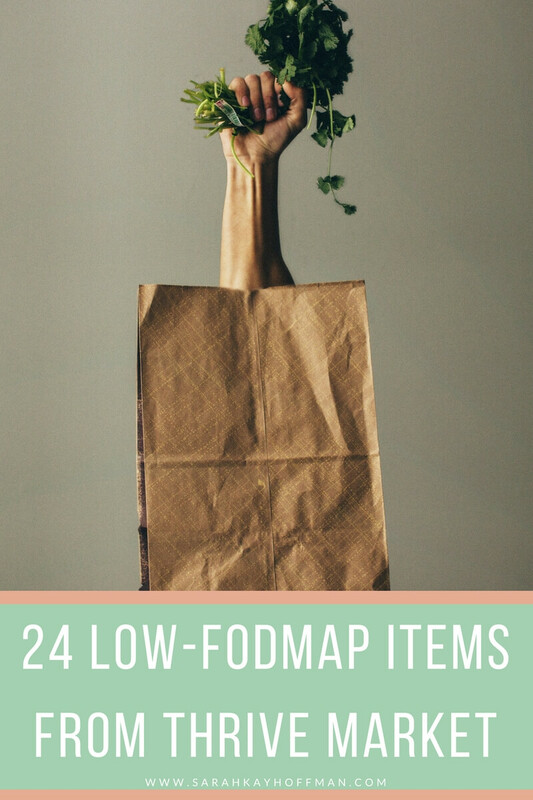 I found 24 Low-FODMAP items from Thrive Market that I wanted to share with those of you in the SIBO/IBS community. I have Certified Gutsy Nutiva Organic Coconut Manna. As part of my Non-GMO Month Dedication to Tracy, I promised to certify one new product, making sure it was something The Daily Grind carries. I asked for a list of everything Tracy ordered for the The Daily Grind, and when I got the list I was beaming with excitement. So many awesome things, so much care for what locals have access to! Because I saw this product in there when I was home in September (and have especially close ties to the company), I wanted to give the full stamp of approval for it. As a reminder, here is what Certified Gutsy means. 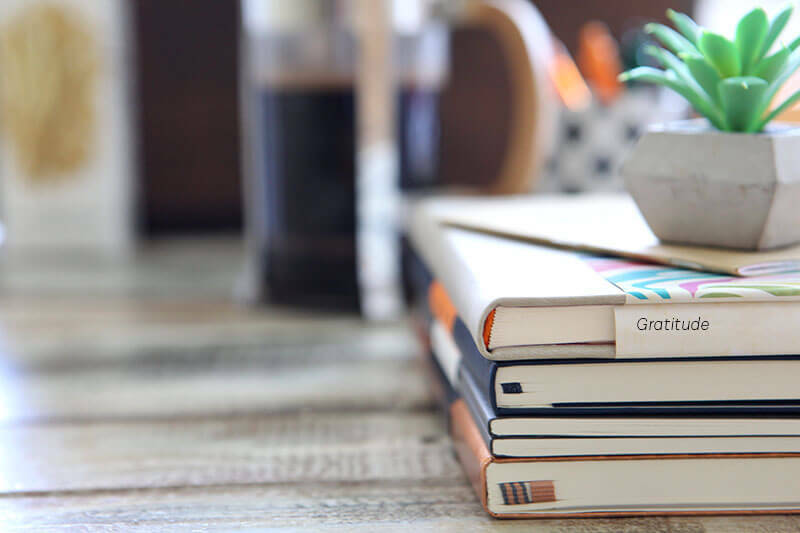 Click HERE to save this post for later + click HERE to check out my Pinterest board filled with all Certified Gutsy products. “We call this delicious puréed coconut butter “coconut manna” because if ever there was a food from heaven, this is it. 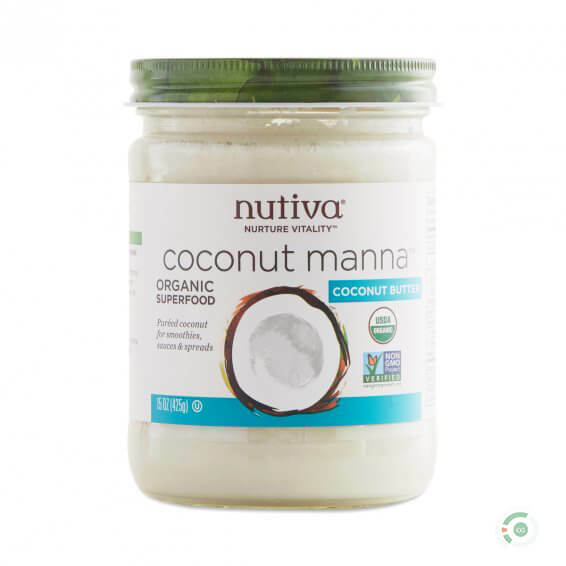 An incredibly tasty, whole superfood made of pure, dried coconut flesh; you can enjoy it straight from the jar, or warm it up to spread the goodness! 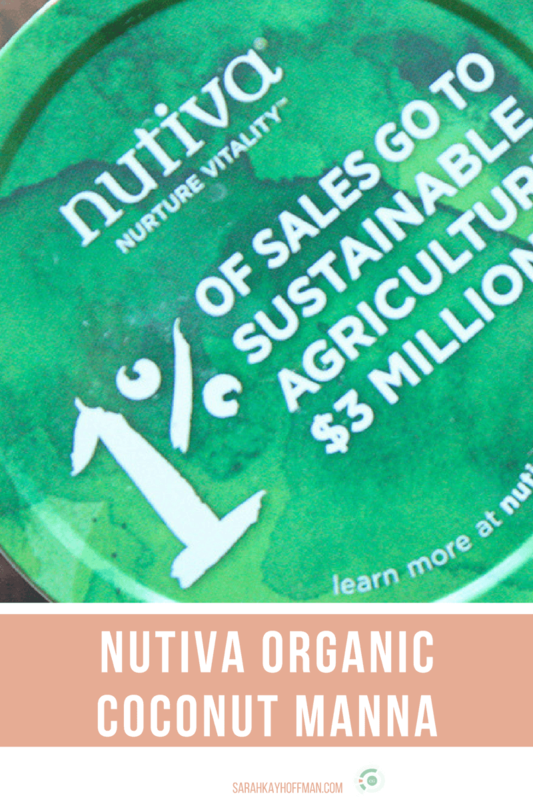 This tropical melt-in-your-mouth treat contains fiber, protein and nourishing fats.” (Nutiva) You can find this product on Amazon, in most natural grocery stores, via Thrive Market, and (of course) at The Daily Grind. 100% organic and Non-GMO Project Verified, contain no cholesterol and are made from fresh coconuts. By nature, the product is vegan, salt-free, gluten-free, dairy free, corn free, soy free, and free of all nuts. There is no added sugar, and a serving contains just 1g of sugar total. This product is an ideal “everything” spread that can replace cream, cream cheese and butter, you can also use it in smoothies, smoothie bowls, Vegan frosting, sauces, dressings, desserts and baked goods. 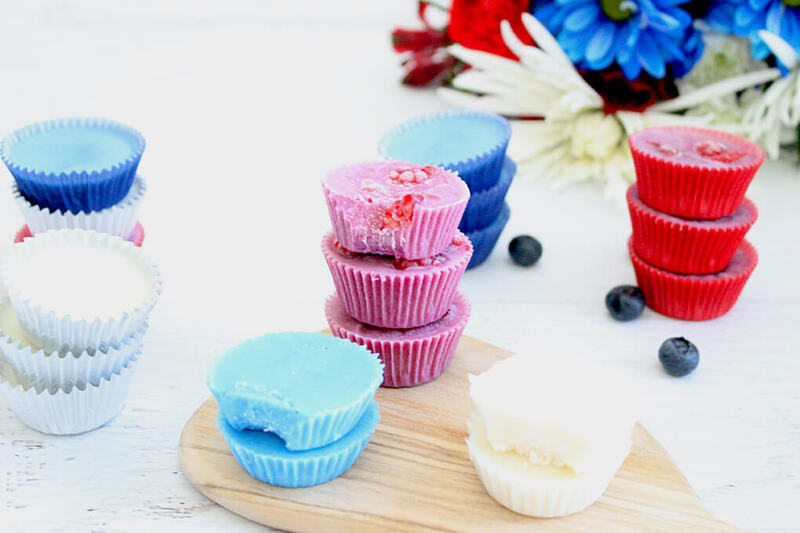 Also, these 35 ways to use Coconut Manna are legit. As for me? Straight spoonin’ + fat bombs. Coconut Manna works for almost for everyone. But for those of you with active SIBO, you’ll need to proceed with caution if you plan on having more than a tablespoon or two per sitting. Coconut Oil is perfectly fine, but coconut flour and dried coconut/shredded coconut can cause problems. This is a great option for those who need an alternative to nuts. Coconut is also wonderful for those who have to follow the stringent AIP Diet (and this product was a staple dessert when I had to follow the diet). Do you include Coconut Manna in things or do you prefer to just spoon it like me? Do you have a product you’d like me to review for potential Certified Gutsy status? Contact me! I have Certified Gutsy Made in Nature Dried Mangoes. 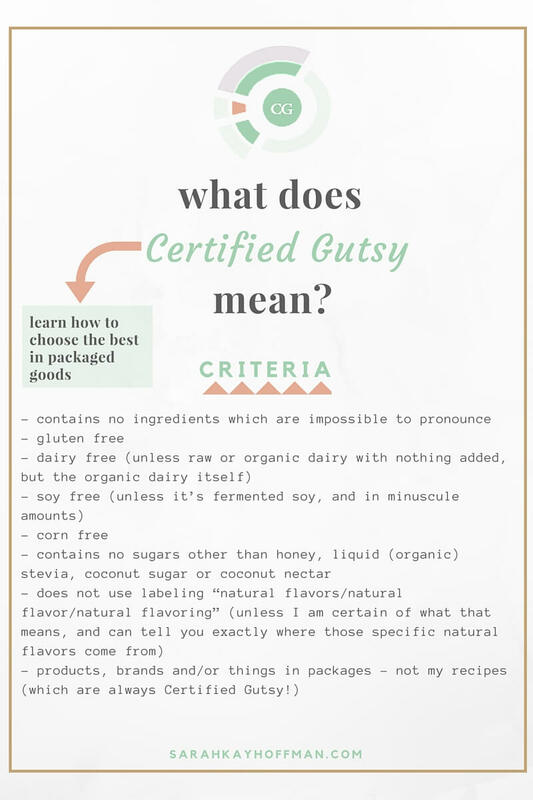 Learn about the Certified Gutsy label. I have always love Made in Nature, and full disclosure, I do work with them on a paid basis for various projects. But honestly? How could I not? I love what they stand for and the products they produce. 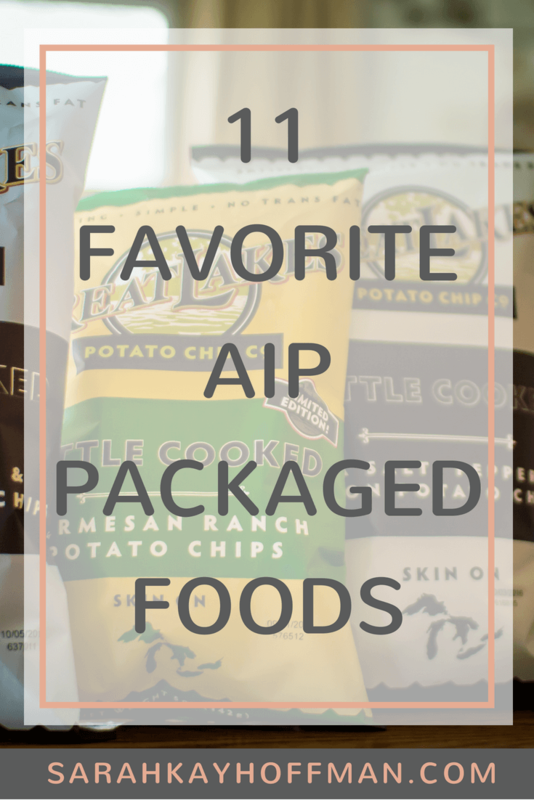 They make snacking and on-the-go easy, not just for me, but (and maybe mostly) for my children. Their mangoes have the Certified Gutsy label stamped all over, so it was time I officially Certified Gutsy Made in Nature Dried Mangoes. 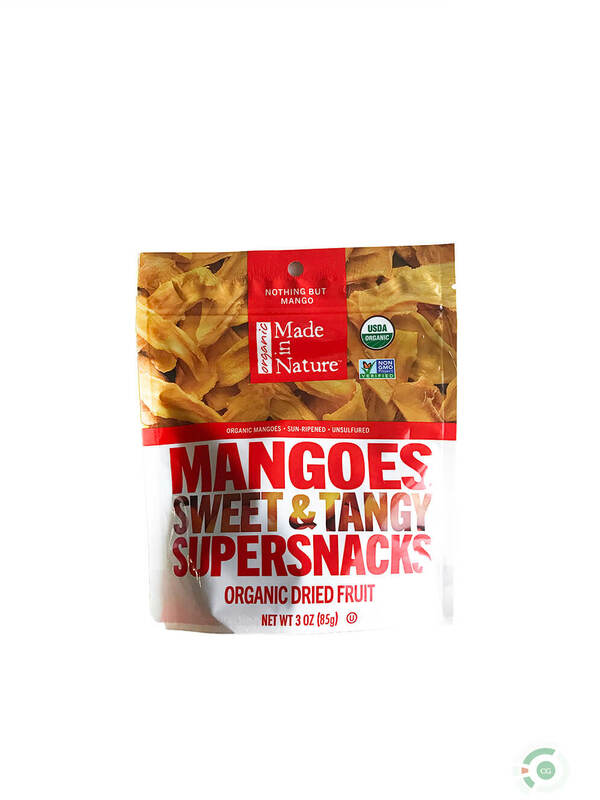 “Ripened in the hot tropical sun, these tender strips of mango serve up a healthy burst of fresh flavor and comic relief from the standard day-to-day.” (Made in Nature) You can find them on Amazon, and for many of you, the best place to get them will be at your local Costco! They can also be found at Walmart (in the produce aisle) and at Target. If neither of those are an option for you, you can click HERE to find a retailer near you that carries them. I’m fairly certain our local Safeway does. 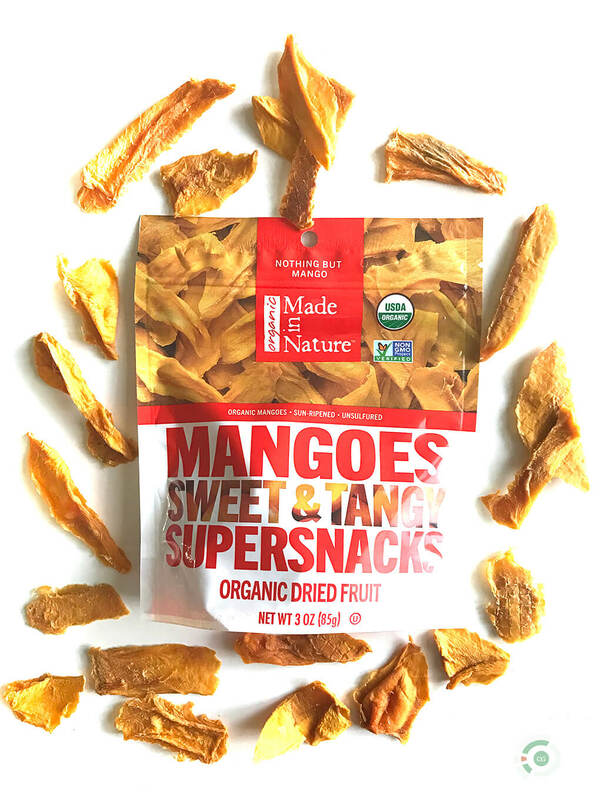 100% organic and Non-GMO Project Verified, tree-ripened, contain no added sugars (which most dried fruit does have added sugar), and (by nature) are vegan, salt-free, gluten-free, dairy free, corn free, soy free, and free of all nuts. Sure you could get creative with them. You could place them on top of an oatmeal, yogurt or smoothie bowl. Or you could just be basic like we are and eat them straight from the bag. If you have a small enough bag of them, throw them in your purse or diaper bag for those ohmygoshmommy-I’m-so-hungry-can’t-wait-one-more-second moments. If you get a large bag from Costco, I recommend grabbing a small and simple Stasher Bag to put several handfuls into for that same purse or diaper bag. Have you had these mangoes before? Can you stop after just a handful or does the bag dwindle quickly? !